I can post something that’s not science can’t I? Nevermind the silly introduction. Below is a quick tip to a common problem for users of the Safari web browser. Update: This tip applies to Safari versions 5.0 and earlier. 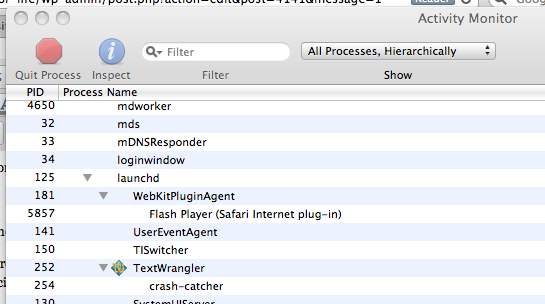 As of Safari 5.1, Flash is a plugin. Open Activity Monitor (under Utilities). Show the processes by ’All Process, Hierarchically’. Locate ‘launchd’ (the launch daemon). Within this should be WebkitPluginAgent, within that FlashPlayer. Double click on FlashPlayer, then click Quit. You’ll be offered to force quit Flash. Done. You may want to close or reload the offending browser window or tab that triggered the stall.